On yesterday’s ‘MOTU Monday’ email from Super7, they had quite the surprise waiting for us! 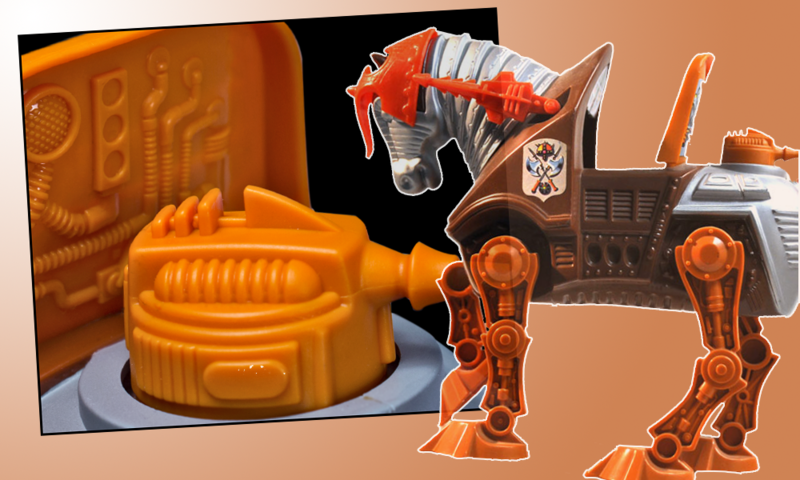 As you can see above it’s an orange turret, which is the backside of Fisto’s horse Stridor. The only details given were “Back in the saddle… Coming next week.” This is very interesting indeed, because it opens up a whole bunch of possibilities. First off, the obvious one is that we are going to be getting Stridor in some fashion. This is probably a good vehicle for Super7 to test the waters on because the tooling is already done from 2016’s Night Stalker. At release, Night Stalker cost $40 so I imagine if we are just getting the horse it will be a bit more than that this time around. But then I got to thinking that we haven’t had a proper Fisto figure since 2010. And that figure was not easy to get hold of at the time, and still commands almost $200+ on the aftermarket. What if Stridor was packed with a reissue of Fisto? Even better, what if Stridor was packed with a Filmation Fisto? Oh, the possibilities here! Makes me a little excited about Masters of the Universe Classics again. I imagine that we will have more information next week, so stay tuned!